"At a recent bridal show, I tasted over 10 wedding cakes and none compared to yours. I am so glad I ordered through Signature." Our Wedding Cake Department is in full swing. Now scheduling FREE wedding cake tasting appointments for ALL 2017 weddings. Call 412-882-9960 to schedule. Savvy brides know a good deal about weddings and they know a good deal on wedding cakes when they see one! Our wedding cakes are the talk of the town. Let us show you why. First, we make our cakes fresh, right here in our bakery located in Castle Shannon in Pittsburgh, PA. Our cakes are never frozen. 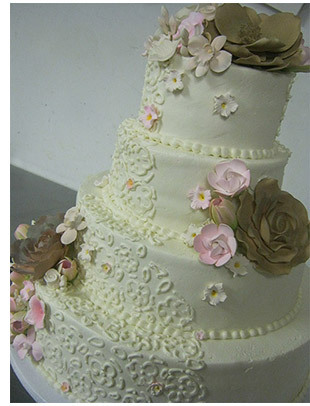 Secondly, YOU get to design your own wedding cake from top to bottom. That's right, the only limitation on design is that it be in Buttercreme icing and NOT Fondant. Our cakes not only look good, but taste delicious! Choose from some of the delicious flavors below that you can have. Most wedding cakes are tiered. Each tier consists of three layers of cake and two layers of filling. Our wedding cake fillings are fresh and delicious. You may choose from the following list. Flowers - We highly recommend that you use sugar or gumpaste flowers** on your cake due to the fact that fresh flowers pose a serious health risk if treated with pesticides. In addition, some flowers and plants are poisonous and not suitable to be placed on or near food products. ** Flowers are based on each cake design. Pricing can range from $10 - $80. See our Wedding Cake Packages (sorry, packages are not available for under 100 guests). If you do not wish to purchase a Signature Wedding Cake Package, we do offer our Bare Essential Package which includes a smaller wedding cake and back up cakes. Please call our wedding cake department at 412-882-9960 for further information.